This colorful Roasted Beet Soup with Apple, Lemon and Creme Fraiche is a winner in my book. This soup is thick, but not heavy, flavorful, and simple to make. Healthy and vegetarian and when you skip the creme fraiche and you’ll have a vegan soup. 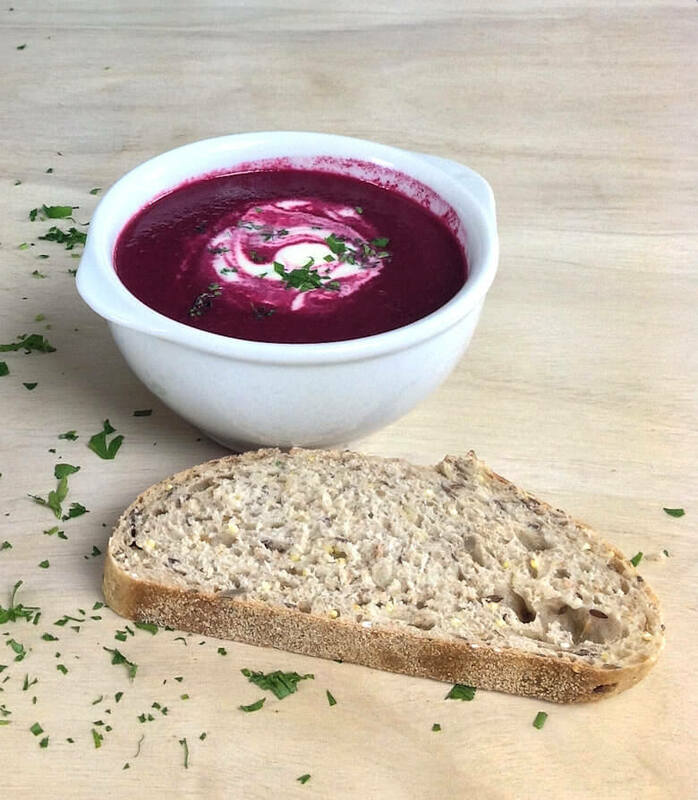 The season for beets is still here, so better make this soup now and freeze some, so we have some more when the vegetable is no longer available. Cook in season while you can. This may be a cold weather soup, but since it is not a very heavy soup it would be very nice to eat it on warmer days as well, especially because of the fruity elements in the soup. 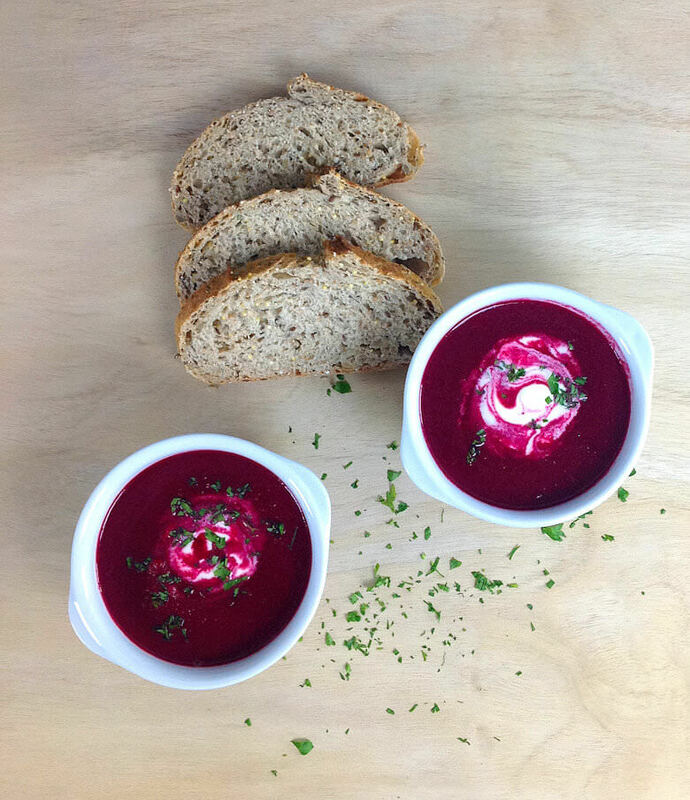 The key for this Roasted Beet Soup with Apple, Lemon and Creme Fraiche is to roast the beets and to not peel the apple. The roasting of the beets will add sweetness because of the caramelization of the sugars in the beets and when you leave the peel on the apple you will add some texture to the soup. The creme fraiche and the lemon add some freshness and richness. The creme makes is richer, that seems to be a no-brainer and a squeeze of lemon juice cleans up the flavor, allowing the flavors to come through better; that’s the best way I can describe it. On the other hand, if you want a thinner soup or smoother soup, you can run it through a sieve; you will eliminate a lot of nutrients, but you soup will be smooth as silk. So this is how the soup is put together. Peel the beets and cut them in dice of approx. 1 inch. Place them on a baking sheet covered with parchment paper, drizzle with olive oil, add some salt and pepper and place a few bay leaves among the beets. Bake in an oven (400 degrees F) for about 35 minutes or until the beets are tender. 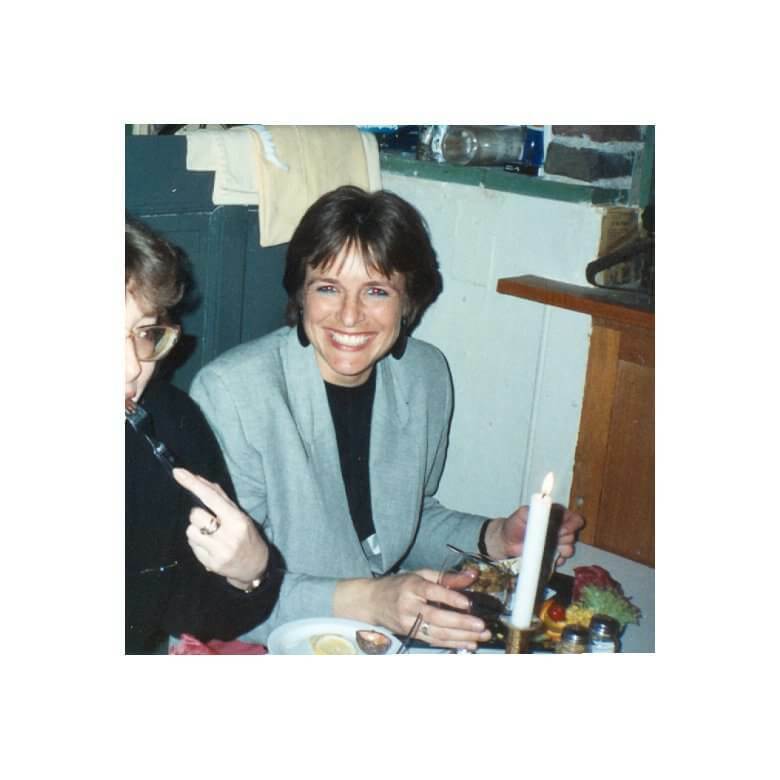 Add oil to a saucepan, peel the onion and cut in pieces, wash and core the apple and cut in pieces, season with salt and pepper and cook until brown and soft. Add broth and beets and bring to a boil. One note of caution; and I have to remind myself every time I peel and/or cut beets: protect your hands if you don’t want to walk around with red fingers for a day or so :-). I always use latex gloves, but I heard and read that soaking your hands in lemon juice or rubbing with salt might get the stains off your skin. Puree soup and season with salt and pepper if needed. Divide over bowls, add a dollop of creme fraiche and swirl a little, sprinkle with parsley and add a squeeze of lemon juice. 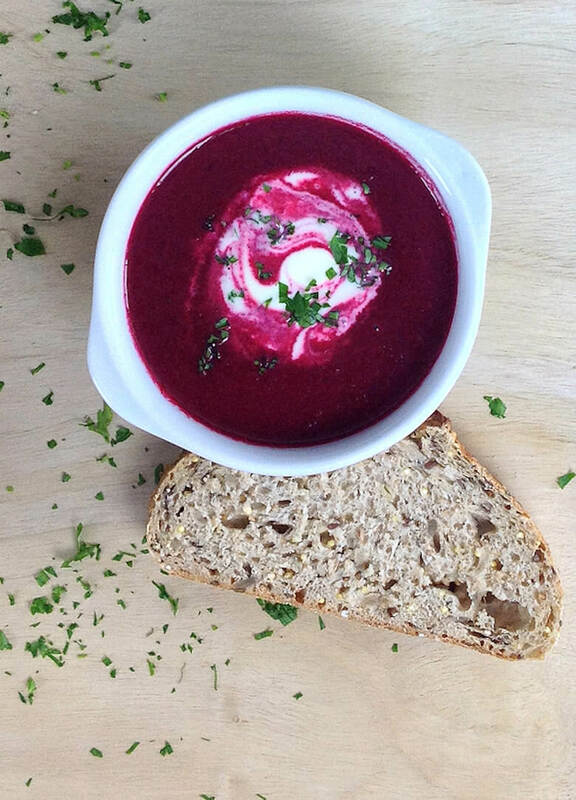 Enjoy the Roasted Beet Soup with Apple, Lemon and Creme Fraiche. It is a beautiful soup isn’t it? Preheat the oven to 400 degrees F. Cover a baking sheet with parchment paper. Peel the beets and dice them. Toss the beets with 1 tablespoon of olive oil and season with salt and pepper. Place beet dice on the baking sheet and add the 2 bay leaves. Bake in center of oven for approx. 35 minutes or until beets are tender. Clean and slice 1/2 onion and wash, core and dice the apple. Add 1 tablespoon of olive oil to a saucepan and add onion and apple and bake until brown. Lower heat and cook until tender. Add vegetable broth and beets (discard bay leaves) and bring to a boil. Puree soup with immersion blender and season with salt and pepper if needed. Divide soup over 2 bowls. Add 1/2 tablespoon of creme fraiche to each bowl, swirl a little and sprinkle with parsley. Add a squeeze of lemon juice and serve. Ilka Elise; isn’t is nice that deep purple. Beets are flavorful and healthy – what a great combination.